I've been busy working on my Sockapalooza 4 Socks. 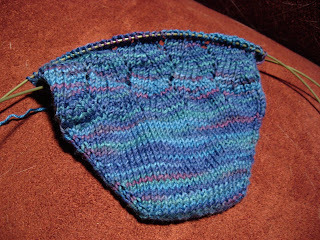 I've turned the heel on the first sock and I only have 15 grams of yarn left. I wasn't sure how much yarn the sock was going to need, so I bought three skeins. I guess I should knit a repeat and weigh the yarn a la Grumperina and get an idea of how long these socks will be if I make them only from one skein apiece. 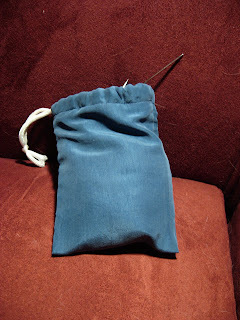 My little sister made me a bag to carry my socks-in-progress around in my purse, but it was slightly too small. 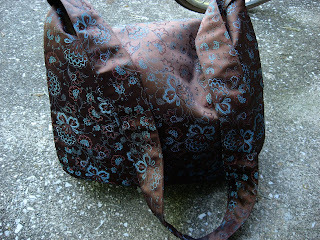 So I found a pattern on the internet and whipped this little bag up. I really like it. Especially because it's red, which seems to be my color of choice this year. Does anyone else go through phases where they buy everything in one color? A few years ago, it was light pink. This year, it's red. Dark burgundy-red. 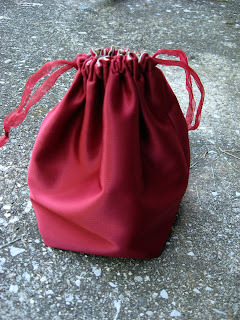 I also made myself a pretty bag for my books for church. The messenger-style means it's also come in handy last week when I was a really good girl and rode my bike to work EVERY DAY. I still want that Biria bike, but I can't justify the cost right now. My little brother got married this past weekend. Hooray for him! But you know, it's really really weird to think that my little brother is all grown up and MARRIED. Does that mean I'm a grown-up too? Here he is with his bride and my grandpa. Don't they all look cute? This was inside (you can't see it all in this photo, but I can't upload photos of everything that was in there in one post). Thank you, Thank you, Secret Pal!!! 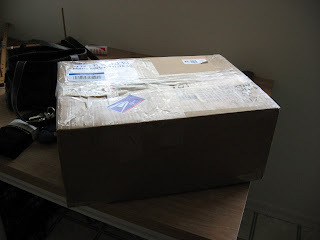 I can't believe how much was in this box: a book called "One Skein Wonders," two balls of alpaca yarn , some wool/silk yarn, cotton sock yarn, ribbon yarn, a container of wool wash, and a little container of something called Wool Wax. It's a lanolin cream and I LOVE it. 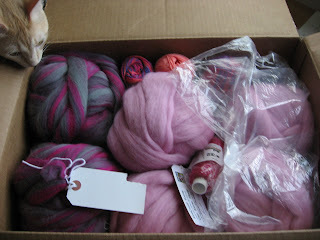 There were also six balls of roving (two light pink balls of merino and the pink and grey and the other two pink balls are Corriedale). Enough for a sweater, I think. My secret pal gave me some ideas of where to find more if I want to make a solid pink sweater, but I may use the grey/pink for a stripe or a yoke or something. I guess we'll see how it spins up. What I want to know is how did she know that I really wanted to make a pink sweater? Did I say something about that somewhere? I had the day off work today to go to my roommate's (well, now it's ex-roommate's) wedding. It was a nice time. The ceremony was very simple and sweet, and it was good to sit around at the reception and talk to old friends. 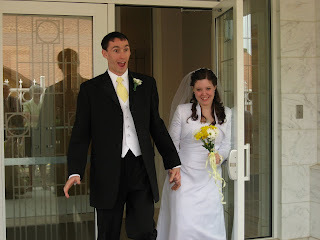 Here they are coming out of the temple after their wedding. He's pretending to be surprised at all the people there taking pictures. She's just happy. They look fabulous. I've been working away on my sockapalooza sock. I keep worrying about it. Is the toe too pointy? Is it going to fit? Will my pal like the colors and the design? I sure hope so! So far, I like this magic loop method. I like that you can knit half a row before you change needles. 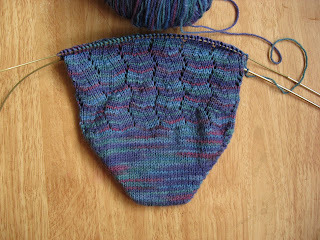 I think I might start the second sock and try to do them both at once, that way I get them the same length. That's always a plus, right? Lots of news this week. 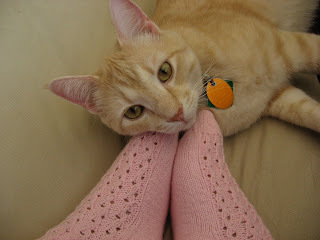 On Saturday, I finished the second Pink sock. I like them! Unfortunately, now that summer is here, it's too hot to wear boots to work, so only black sensible socks for me for a few months. We have a dress code at work and my manager has specifically mandated (for my benefit) "NO FUNKY SOCKS". Only black socks are allowed. In a fit of rebellion, I bought some nice black boots to wear so no one can see if my socks are blue or purple or orange or pink. I'll just have to stockpile a stash of "funky socks" to wear once the weather cools down again. Isn't my Jamison cute? I'm going to have to take some good pictures of Mattie to post or she'll be jealous. 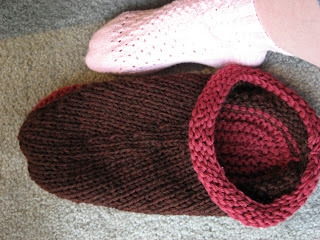 I had two skeins of Cascade 220 left over from Eris, so I went to the yarn store and bought a skein of brown yarn and the pattern for Fiber Trend's Felted Clogs. I whipped the first one up on Saturday and haven't started the second one yet. I may do that this week and wash them when I go home over Mother's Day weekend. Someday I will have a house with my OWN washer and dryer. On Tuesday I went shopping for yarn for my Sockapalooza socks. It's Lorna's Laces Shepherd Sock in the Tahoe Colorway. 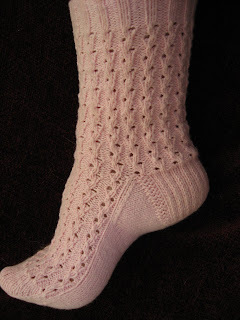 I think I'll be knitting these toe up and using Melanie's Twisted Stitch pattern. I decided to try out the Magic Loop method and bought a very long 2mm (0) needle. I keep casting on the wrong amount of stitches, though. I can't count very well, apparently! I'll have pictures of that next time. And finally, I got an e-mail today saying that I've been accepted into the University of Kentucky School of Library and Information Sciences Graduate Program! Whoo-hoo! I didn't think I'd get in. It'll be a long haul, though. I'm trying to avoid debt as much as I can, and I don't want to give up the full-time benefits of my job. So it'll be a night class here and there for several years, I think. I'm still in shock.